Petra Mason is one of those people who does many things very well. She is a cultural historian, a founding partner of Books & Books Press, and has published and produced many books including New York, The Glass House and The Spirit of Miami Beach. I discovered her through an eye-catching volume on a friend’s coffee table: Beefcake 100% Rare, All Natural, a study of male pinups of the 1950s and 60s. 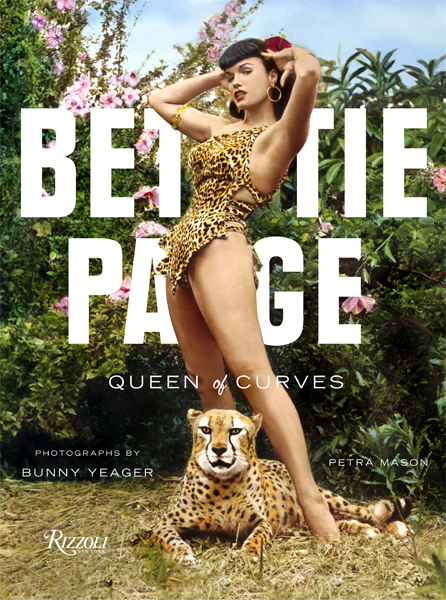 Mason also explored female pinups of that era in Bettie Page Queen of Curves and Bunny Yeager’s Darkroom. Though sumptuous, these books are rich in historical and biographical detail, with intros by notables like Dita Von Teese and Lady Bunny. There is more going on than cheesecake, but it’s a whole lot of fun. Mason also wrote the introduction for and edited Skira/Rizzoli’s recent Imperfect Utopia on Carlos Betancourt, the mixed-media artist who helped launch the Miami art scene in the 1980s. She is also witty, professional, and a delight to deal with. PWP: How did you discover Bunny and Bettie? Petra Mason: Ages ago I fell for Bunny’s fräulein braids and hairdo in the shot of her and Bettie at Africa USA. It must have been the postcard book Taschen did in the early 1990s – I had the entire set pinned up. Moving to the US, I looked Bunny up and was amazed she was listed online, with a phone number. 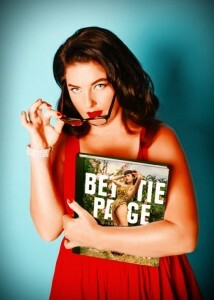 PWP: In Bettie Page Queen of Curves and Beefcake 100% Rare, All Natural you explore pinups from the Fifties. While they show male and female forms frankly, there is a playful, almost wholesome spirit. Can you talk about how this has changed? PM: In some ways my intention with both books is to shine a light on just that. I am horrified by the state of the naked figure in contemporary photography and society. While the repressive state of the 1950s is nothing to be glorified or lamented, the art of the tease and the “naughty not nasty” poses adopted by both male and female pinups, which spare their dignity, and show personality, are far more appealing than today’s rectal and gynecological studies. I’m still bewildered as to how we got to this low point following the liberation of the 1970s, and all the good work that was done. We need to talk about this again. In some ways I think what happened is because pinups fall into the “kitsch” category they’ve been neglected as too prim, or too blue collar. PWP: People may laugh, but there is history in these pictures. What attracted you to their time and place? PM: I’m perpetually longing for another era, be it jazz age Paris, on the disco floor in the 1970s, or with Leigh Bowery in London in the 1980s, I’ve yet to engage fully with the present time and place. I grew up in South Africa during apartheid and a State of Emergency, so I guess time capsule traveling was a convenient way out, and this I could do via photography books and music very easy. PWP: Did you ever speak with any of the pin ups? PM: Amazingly, I did! I even got to meet a few: Mary Robbins (who recently passed away) was at Bunny’s retrospective in Miami, she was wearing an oxygen tank and apparently lived in a caravan park with hundreds of cats. Then on the opening night of Bunny’s Wynwood show a few came out of the woodwork, still all glamorous and rather amusing, very chatty, posing with early pinup shots of themselves. Actually, I had helped a young German film-maker Verena Auriga with her research as she was trying to locate other models, to do a documentary, but very tragically she drowned while surfing midway through the project. PWP: What’s next for you? Are there any books/projects in the works? PM: I edited an art book for Rizzoli/Skira book that’s out this fall, but as far as cultural history projects, I am NOT SAYING just yet, but have some contracts on the boil…wink. PWP: Whatever it is, we’re looking forward and know it will be great.